All children but one grow up. She is beyond adorable. What a sweetheart. This was the most uplifting thing I've seen on the net today. She's gorgeous!! Is her hair coming in red? And she's showing green eyes? I hope Hal and Archer learn martial arts before she's of dating age. She is JUST. SO. GORGEOUS. How do you not eat her up every single day? Fable has such a beautiful smile! she makes me happy. Rebecca, I think you're fabulous. I always look forward to your posts. I have been reading your blog for sometime but just now built up the courage to say hi. You write so beautifully and you inspire me. Thank you for being you! How you ever manage to get any work done is beyond me. I have a hard enough time, and I just have photos of her to look at! Oh my GOD at her smile. You have the most gorgeous children the blogging world has ever seen. I just started reading your blog and I'm so glad I found you. I have a seven-month-old girl. I can relate to you on so many levels. You are brilliant, sweet, original, and entertaining, without trying too hard. May God continue to bless you and your beautiful family. I'm going to buy your book this week. =)I'll let you know what I think, though, I already know that I will love it. Oh, she's beautiful! And growing up so fast! I should add that my 14-month-old has a terrible cold and is being a real turd. 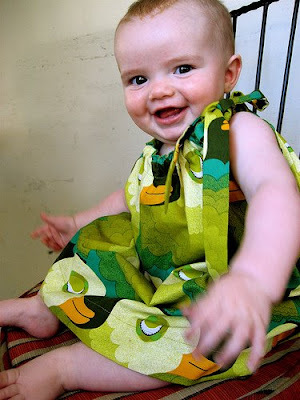 But she was on my lap when I opened your blog, and when she saw Fable's big smile, she started smiling and laughing. Fable is good for the whole world! She's so dramatic! I love it. Great facial expressions. holy shmokes!!! when did her hair turn all red??? What does this make Archer? I'm guessing he'd probably be happiest as Captain Hook maybe? And I LOVE the last picture. 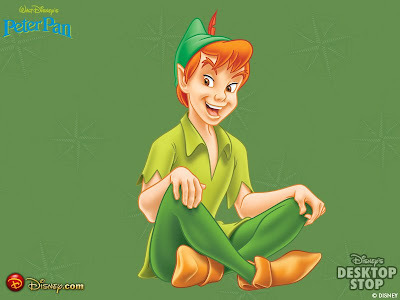 I had a tape of Mary Martin's Peter Pan when I was little and used to love watching it! Oh! That little wave of hers at the bottom of the post just knocked me down. That's way too cute. Wow. That is like a little bit of magic fairy dust. I mean Fable dust! If even possible, that baby gets more adorable each day. Really. It's just not right. But also, is totally. Ohhhh the cankles, so yummy......so sweet. I just want to eat her up. I love, love, love your daughter!! My little ladies can have those fresh faced smiles, but somehow our clothes never look so nice . . . how do you do it?? 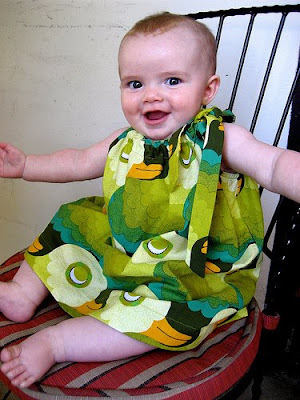 That is SUCH an adorable dress! Both of them really! You make me feel like I *need* to go shopping! You have a big 7 month old! 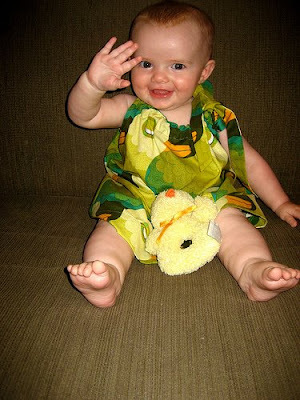 I just love that she's waving. Definitely getting cuter all the time. Oh my god I want to cuddle that adorable baby and kiss her cheeks! She's just the sweetest little thing! Excellent! I can start my day now. OMG! I think she may be cuter than my babies were. And that is saying a lot! Holy mother of all, that child is precious! I just want to eat those toes. 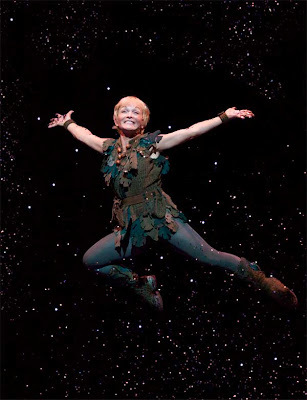 "The second star to the right"
Fable makes an ADORABLE female version of Peter Pan!! 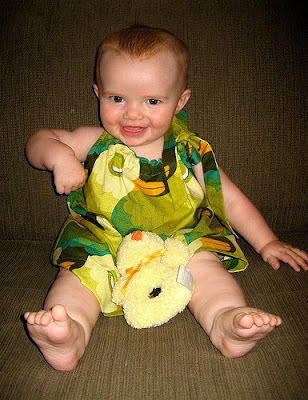 =D And I'm sure when Fable's around 4 or 5, that you'll really get into the whole dress up thing even more. I'm just curious - which came first? Did you look at those photos and immediately think of Peter Pan? 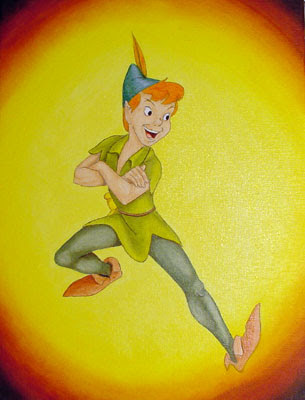 Or did you think of Peter Pan/Tinkerbell and then take the photos??? Either way, love it! She's a doll! The pictures came first and then I was like... "who does she remind me of OH MY GOD SHE'S A LITTLE PETER PAN!!!" 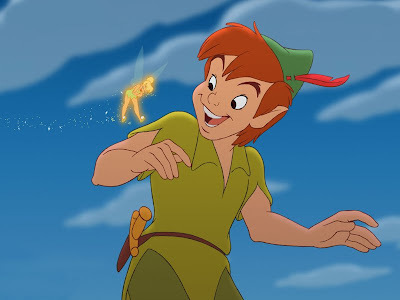 I can totally see Peter Pan... you were so right. Absolutely beautiful, that Fable of yours. Hahaha! How do you come up with these comparisons? Too adorable! Awesome, and one of my very fave Halloween costumes as a child was a hand-made Peter Pan costume.